John Gladstones is one of my gurus in interpreting the effects of environment on grape growing and wine quality. His work in Australia earned him an award of Special Distinction in Viticulture by France’s Office International de la Vigne et du Vin. It has only been in the last few years that his preference in topography and aspect of vineyard sites has been fully appreciated and demonstrated to me – in a dramatic fashion. The classic explanation for California’s wonderful climate is: There are warm days for accumulating sugar and ripeness, and there are cool nights to maintain the acids, and keep the pH low. This is quite true, and it does work well, but for those of us desiring better than good, Gladstones has another thought. I offer that his opinion would be based on adequate soil, sufficient water, and the particular varietal/s being near their cool, climatic edge. That given: if their topographies are carefully examined, the very best vineyards will usually be found to have two or more of the following features. All of these features are associated with reduced temperature variability, through reduced diurnal range and, especially, higher evening, night and early morning temperatures. 1. They are on slopes with excellent air drainage, and are situated above the fog level. In a limited way, this is the wonder of Ontario’s Beamsville Bench. These conditions describe Plum Ridge Vineyard, Charlie Smith Vineyard, Ivy Glenn Vineyard, Caldwell Vineyard, and the vineyards on Underwood Mountain in the Columbia River Gorge. While the cold, evening air runs down the hill, the warmer air recirculates to the top of the ridge. While the cold air accumulates into the valley, the upper portion of the vineyard is subjected to a recirculation of warmer air. A couple of years ago I sold Cabernet Sauvignon from the southern Napa Valley floor, a nice, cool site. I took a professional winemaker to Charlie Smith’s vineyard and then to the vineyard in Napa’s Oak Knoll district. Near the end of July the winemaker saw the Napa Valley fruit more advanced, riper. The riper fruit and the Napa Valley appellation won his purchase. The end result was Charlie’s fruit came in ripe with wonderful flavors, aromatics. The Oak Knoll fruit was quite good, acceptable, but had a slight green edge – not quite ripe. 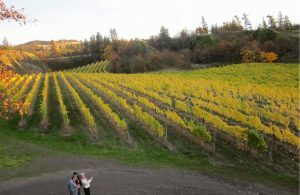 Given a cool fall, the ridge top fruit ripened day and night (with good acid & low pH), leaving the valley fruit behind. Brehm Vineyards does source from quality valley vineyards (especially in the Carneros) and does provide some of the finest grapes from the ridges and hills of Sonoma, Napa, Mendocino, Columbia Gorge and Sierra Foothills. Check them out in your fermentations.